Available to over 60 destinations in Majorca including the popular beach resorts of Cala D Or, Alcudia, Cala Millor, El Arenal, Magaluf, Puerto Pollensa, Sa Coma and Santa Ponsa. Whether your looking for a cheap bargain bucket deal for under £200 or fancy splashing out on 5 star luxury resort at over £1000 per week we have found you some great value for money holidays from On the Beach. There are even flexible payment options available so you can secure your 2019 holiday today with a low deposit and then spread the cost with monthly payments right up to 2 weeks before departure..
Lead in price of £129 per person was for a 7 night holiday staying at the Hotel Golf Beach, Santa Ponsa (TripAdvisor Rating 4.5) departing London Southend on 7 May 2019 based on 2 sharing. 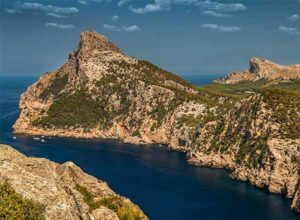 Steeped in history and blessed with natural beauty there is far more to a holiday in Majorca than just sunshine and beaches. For Families: When the kids get bored with the beach you can whisk them off to water parks, adventure parks, aquariums, boat trips, karting or the marine zoo to name just a few of the available family attractions. For Culture Lovers: Remarkable sights are waiting to be explored across the island including Roman ruins, castles, medieval fortresses, manor houses, picturesque villages, caves, museums and art galleries. 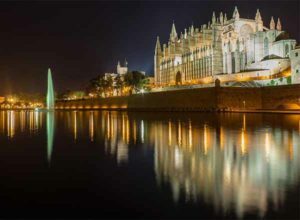 Not to be missed is the stunning gothic cathedral in Palma. For the Outdoor Active: Head off to one of the Natural Parks or the UNESCO World Heritage Serra de Tramuntana mountain range which runs from the south west to the north east forming the backbone of the island. Cycling, walking and hiking are all popular and you will find well maintained paths suitable for most abilities. If you prefer not to travel too far from your resort there are some amazing watersports available at many beaches to get the adrenaline flowing. Katmandu Park: Voted the best amusement park in Majorca and number 2 in Spain, the park offers everything from family fun for youngsters through exciting rides to mind-blowing adventures for thrill seekers. Bellver Castle: Located 3 km from the centre of Palma this 14th century gothic style castle is of circular shape which is unique in Spain and houses the city history museum on the ground floor. s’Arenalet Nature Reserve: This 500 acre wetland is perfect for either a bike trip or a 2 to 3 hour walk. The area is rich in plants and an idyllic location for watching the birds on the water. Hot dry summers and beautiful beaches are a major attraction. With 1,400 km of coastline, over 250 beaches and around 50 km of sandy shores it’s the perfect short haul beach destination. 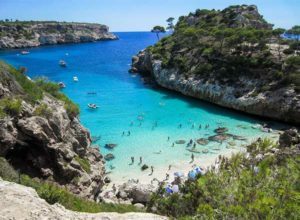 Whether you prefer family friendly beaches with golden sand and gently sloping shallow waters or are looking for an isolated little cove off the beaten track offering complete privacy you will find it in Majorca. Alcudia Beach: The largest beach in Majorca at over 3 km long with fine sand, shallow waters and a variety of watersports. Close to bars, cafeterias and restaurants it’s perfect for families, couples and friends. Nightlife in Majorca varies dramatically from resort to resort and the time of year you visit. Family oriented resorts such as Santa Ponsa and Puerto Pollensa have a laid back relaxed atmosphere with plenty of restaurants and bars while the capital, Palma Nova, offers a vibrant nightlife with many late bars and a host of top restaurants. If you are heading off with a group of friends and seeking somewhere with a very lively atmosphere where you can party into the small hours Magaluf could be the place for you. Prices shown are for guidance only and were available at the last update. Actual price will vary depending on the departure date/time, departure airport, airline, time of booking, hotel and duration of your holiday. Holiday provider: On the Beach – ABTA No K0813 – ATOL 10017.